9 Oct 1999, around noon. Highpoint #2. 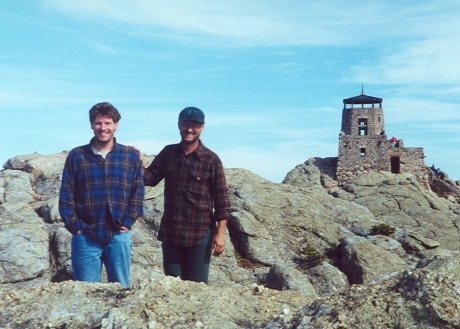 On Fri 8 Oct 1999, Tom Buckley and I set out for a four day backpack into the Black Elk Wilderness centering around climbing South Dakota's highpoint, then named Harney Peak. Before we started the hike, to get some insight on likely water sources and good campsites, we stopped by the visitor center in Custer State Park to ask some questions. (Harney Peak is not quite in Custer SP, but it is very close, so that seemed like the place to inquire.) On asking about water sources, we were directed by the (non) helpful park employee to the water fountain in the corner. When we replied that we wanted to find water on the trail, as we would be out for three days, we received a shocked expression, as if the park employee had never heard of anyone being out that long! Needless to say, we got no useful advice there. On the 8th, we backpacked to a nice campsite at the intersection of the Grizzly Bear Creek Trail and Horse Thief Trail, about 2 miles from the summit. 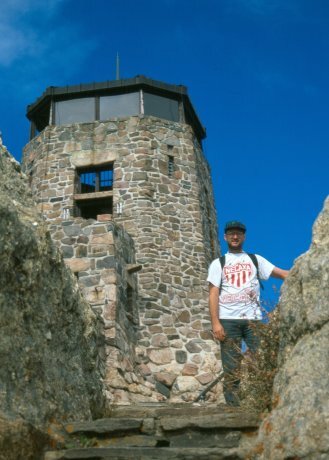 The next day, we hiked to the summit of Harney Peak, the highest point in South Dakota. From our camp, it was 3.7 miles, with 2200 feet of climbing, to the 7242 foot summit, which we reached around noon. On top of the peak is a lookout tower, originally built for spotting fires. Fittingly enough, it was in the process of burning down! The tower had a slow steady fire in some of the floor beams, and emitting smoke. Fortunately, it was soon put out with no significant damage to the tower. The view from the top was spectacular: Cathedral Spires and Little Devil's Tower were to our south, as we ate lunch on a rocky outcropping facing west, watching some goats far below us. Four states were visible: Wyoming, Montana and Nebraska, as well as South Dakota. We then returned to camp, descending 600 feet to the Sylvan Lake Trail junction, 300 feet to the Grizzly Bear Creek Trail junction, and then another 1300 feet down to our campsite. Tom on the steps to the fire tower. Me and Tom on the summit, with the fire tower behind us. The same day that we reached the top, Texas football coach Mack Brown picked up his second victory over Oklahoma, 38-28, en route to a high 20's national ranking that season. It was quite a while until the Longhorns knocked off those Sooners again. 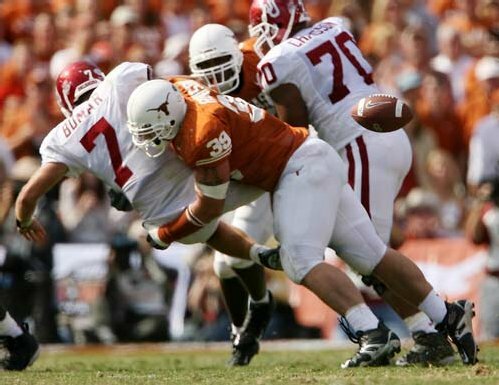 Finally, on 8 Oct 2005, Texas crushed them 45-12. I did get to watch that one! Oklahoma QB Bomar ('Bomar Sooner') fumbles the football, which was run back for a score. Ha ha. 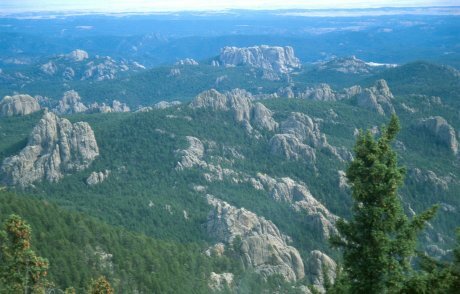 On 11 Aug 2016, the peak was officially renamed to Black Elk Peak from Harney Peak. 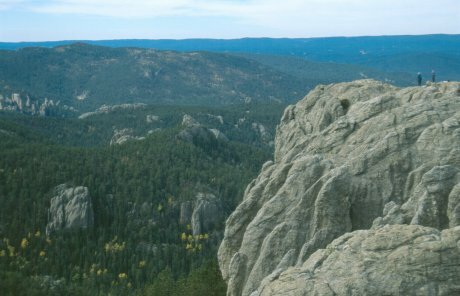 Hiking South Dakota's Black Hills Country. By Bert and Jane Gildart. Falcon Press, 1996.